SRLs, or self-retracting lanyards (or lifelines), are essential pieces of safety gear for those working at any height above the ground. One of our most popular fall protection components, and one of the best values, is the 13-foot FrenchCreek Production Renegade self-retracting lifeline system. This unit uses high-strength, wear-resistant webbing; has a 400-pound capacity; and comes with aluminum and stainless steel components for corrosion resistance. The FallTech self-retracting lifeline lineup includes a full range of lengths and features galvanized steel cables in 25, 30, 50 and 60-foot lengths. These FallTech SRLs conform to OSHA regulations and ANSI Z359 standards. 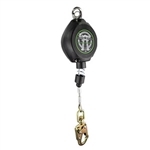 FrenchCreek Outlaw Series 20' Leading Edge Self-Retracting Lifeline with Galvanized Steel Cable.